Thread: 4 old cans that came with my stuff. I've never been a collector of these, but I don't throw stuff away. Do people trade for these? Are they legal to ship? empty legal, full not so much. those look to be in good shape so there might be some collector value to somebody. I already have some that I was given that decorate a shelf. The unique and bullseye cans are very very cool.. not worth a lot, but totally cool. I don’t have any of those squatty cans. I do have many of the others. The old 4320 can is collectible. Again not worth a great deal, the powder is worth more than the cans if you use it up first. Then list the cans here for shipping cost of a medium FRB and they will find a home on somebody's nostalgia shelf. Those are pretty neat. Any idea on the date range for the unique and bullseye cans like that? empty legal, full not so much. That's what I was wondering. I could foresee an issue of it alerting a dog due to having residue or whatever and still being considered to have the substance in it, and didn't want to Duckduckgo "how to make mail not smell like explosives." Does it affect burn rate or pressure or anything that would require not using it? Very cool. Over the weekend, I just finished using a can of Unique, identical to the one in that picture. It has been charging 9mm, 38 and 10mm cases. Still works great! 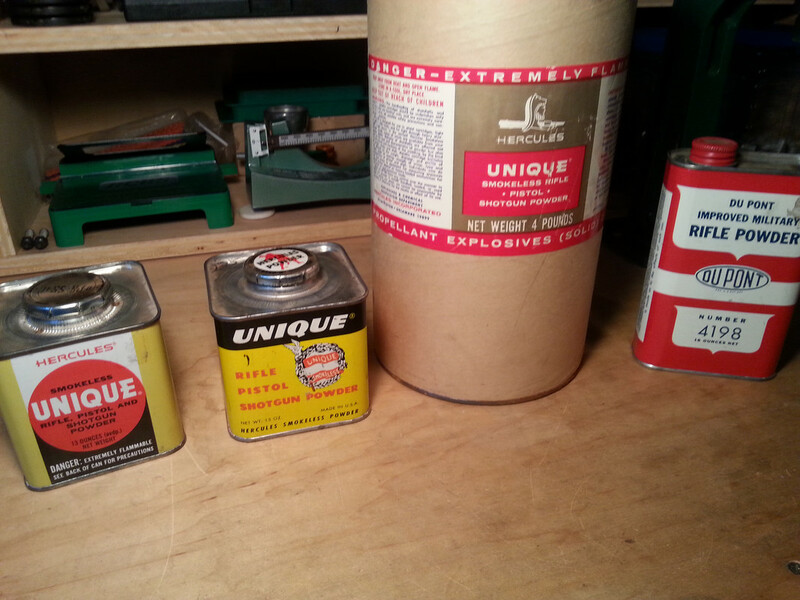 I also recently finished a can of 4198 that looks to be close in age to the 4320 in the photo. The 4198 made some soft shooting 30-30 loads. The granules of the old 4198 look different than modern IMR 4198. The old stock has longer/skinnier granules. Likewise the vintage Unique granules look different than the modern Alliant version. Shape is close. Alliant looks darker and it is less volumetrically dense. I'll probably list some of the old cans that I have "free to a good home." Not too sentimental to me. Last edited by Taterhead; 11-13-2018 at 12:55 AM.